The business leaders group Identity Clark County (ICC) has appointed Terry Wollam and Cyndi Holloway to the group’s Board of Directors. Mr. Wollam is owner and managing broker of Wollam and Associates, a real estate brokerage through RE/MAX Equity Group. The lifelong Vancouver resident has 20 years of real estate development and sales experience including participating in development of more than 1,000 residential properties. He recently completed a one-year term on the ICC Board through the Ed Lynch Honorary Board Seat. He is past President of the Clark County Association of Realtors and studied business at WSU Vancouver and Clark College. 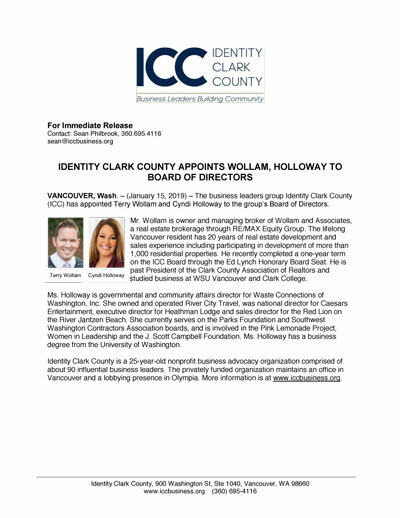 Ms. Holloway is governmental and community affairs director for Waste Connections of Washington, Inc. She owned and operated River City Travel, was national director for Caesars Entertainment, executive director for Heathman Lodge and sales director for the Red Lion on the River Jantzen Beach. She currently serves on the Parks Foundation and Southwest Washington Contractors Association boards, and is involved in the Pink Lemonade Project, Women in Leadership and the J. Scott Campbell Foundation. Ms. Holloway has a business degree from the University of Washington.